Dejounte Murray looked like the rookie he is, but when it mattered most the Spurs went to their best threat at point guard. When Tony Parker rested during the regular season, San Antonio Spurs coach Gregg Popovich typically inserted Dejounte Murray into the starting lineup, continuing to us Patty Mills as a scorer off the bench. Even still, it was surprising that Popovich started Murray in Game 3 of the Western Conference Semifinals, on the road in Houston. The moment was too big, and despite Murray being a plus 11 in 14 minutes, he had two turnovers, was 1-of-5 from the field and got blocked on a layup he should have dunked. Mills didn’t fair much better at the one, finishing the game a minus seven with three turnovers, and shooting 4-of-14 from the field. 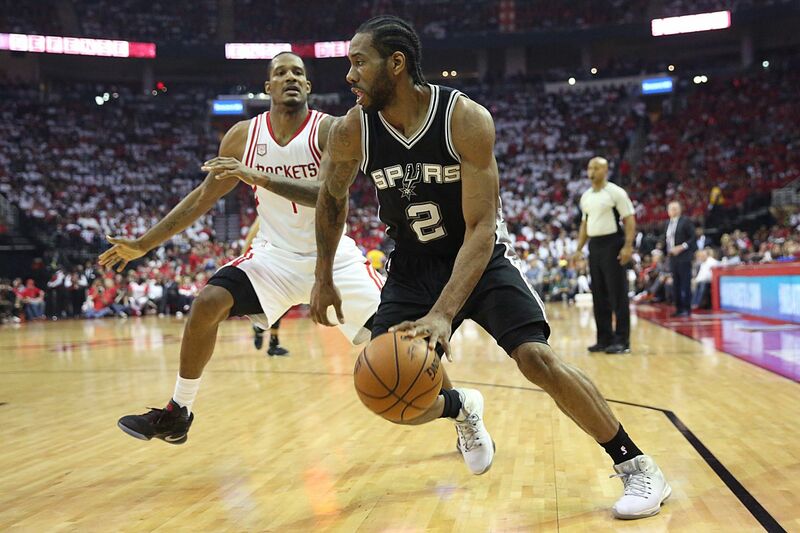 Leonard finished with 26 points, 10 rebounds and 7 assists to follow up an 8-assist performance in Game 2. Without Parker initiating and penetrating, Leonard is the best option to play point guard for the Spurs. The NBA is becoming more and more of a position-less league. Teams are electing to play five players that maximize space and shooting with their best player handling the ball. Russell Westbrook, James Harden, LeBron James and Giannis Antetokounmpo are just a few example out players who are not traditional point guards but have thrived when given the keys to their teams’ offense. Watch all five Rockets abandon their assignments and move towards the lane. Leonard finishes the play anyway, because he’s that good, but everyone else is open because of the attention he commands. Leonard didn’t have to play on the ball when Parker was healthy. Additionally, the Spurs run a lot of motion offense which doesn’t require a primary ball handler. But in these playoffs, when so much comes down to taking advantage of mismatches, the Spurs are best off with Kawhi being commander-in-chief and deciding where the ball goes. The Spurs should continue to utilize Point Kawhi moving forward, as Mills is much better off the ball as a spot shooter and cutter. Even looking towards next season, the need to develop a point guard of the future is less relevant when you have someone like Kawhi. The Rockets realized that putting the ball in their best player’s hands and surrounding him with shooters would maximize their offense. With Parker out indefinitely, the Spurs would be wise to do the same.